In most cases more than 40% of your utility bill goes toward heating and cooling. Here are some suggestions to save you money, make your home more ecofriendly, energy efficient, and more comfortable to live in. Clean or replace filters at least once a month or as needed. Use venting fans wisely in kitchens and bathrooms. Turn them off as soon as you can; in just 1 hour, these fans can pull out a houseful of warmed or cooled air. During hot days keep the windows covered that face south to prevent the sun from heating the house as readily and set the thermostat as low as is comfortable. During cold days do just the opposite to gain as much free heat as you can and maintain an equilibrium from outside to inside air. Select energy-efficient equipment when you buy new heating and cooling equipment. In most cases a little extra cost up front will pay off in both utility bills and comfort. 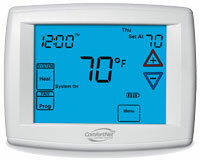 Program your thermostat to raise or lower 5 degrees during the hours when it is not needed as much. During cold night hour reduce airconditioning, during the hot day hours reduce heating. You can save as much as 10% a year on your utility bills this way. Follow the product instructions and wear the proper protective wear when installing insulation. Consider factors such as your climate, moistur conditions, building design, and budget when selecting the insulation type and R-value for your home. Use higher density insulation, such as rigid foam boards, in open ceiling architecture and on long run outside walls. Recessed light fixtures can be a major source of heat loss. Be careful how close you place insulation next to a fixture unless it is marked "I.C." Check your local building codes for recommendations. Attic vents can be installed along the entire ceiling cavity to help ensure proper airflow from the soffit to the attic to provide moisture control and make a home more comfortable and energy efficient. Have an older home and haven't added insulation: in a recent survey, only 20% of homes built before 1980 were well insulated. Are uncomfortably cold in the winter or hot in the summer - adding insulation creates a more uniform temperature and increases comfort. Built a new house or addition, or installed new siding or roofing. Are bothered by noise from the outdoors (insulation helps to muffle sound). Are concerned about the effect of energy use on the environment. Remember the way your filter looks is what you are breathing in and out everyday if you don't regularly change it. We offer quick and easy filter selection and will even directly send you the filters you need for your units on a regular basis. If you suffer from a problem listed above we've got a solution. Call Cook's for a ULTRVATION filtration system. It can be added to any system and removes up to 90% of air contaminants.